"Matilda the Musical", based on the Roald Dahl children's story about a precocious child with psychokinetic powers, won a record seven Olivier Awards on Sunday, beating the previous best of six on British theatre's biggest night. 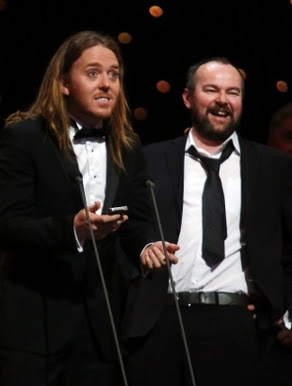 The Royal Shakespeare Company production, which transferred to the Cambridge Theatre in London's West End theatre district, was created by Dennis Kelly and Australian musician-comedian Tim Minchin. Among the prizes it picked up at a red carpet ceremony held at the Royal Opera House was best actress in a musical which went to the four girls who shared the title role. Cleo Demetriou, Kerry Ingram, Sophia Kiely and Eleanor Worthington Cox, aged between 10 and 12 years old, were the youngest ever recipients of an Olivier Award, according to organizers. But the shared honor did have a precedent -- the boys who played Billy Elliot in the ballet musical took the best actor in a musical prize in 2006. Matilda's other honors on the night were actor in a musical (for Bertie Carvel), new musical, director (Matthew Warchus), theatre choreographer (Peter Darling), set design (Rob Howell) and sound design (Simon Baker). It was nominated 10 times, the maximum number of categories possible. At the ceremony, Brian May joined the cast of Queen musical "We Will Rock You" for a rendition of "Bohemian Rhapsody", while there was music and dance to celebrate special awards for lyricist Tim Rice and outgoing Royal Ballet director Monica Mason. Among the other awards were best new play for "Collaborators", in which Soviet dictator Josef Stalin commissions a play from writer Mikhail Bulgakov, and best revival for "Anna Christie". The play featured movie actor Jude Law, but it was his co-star Ruth Wilson who picked up her second Olivier Award with a best actress honor. Best actor was shared by Benedict Cumberbatch and Jonny Lee Miller for "Frankenstein". The English National Opera triumphed with best new opera production for "Castor and Pollux" as well as outstanding achievement in opera in recognition of "the breadth and diversity of its artistic program". Edward Watson scooped the outstanding achievement in dance award for his performance in "The Metamorphosis" at the Royal Opera House and best new dance production went to the Bangladesh-inspired "Desh" at Sadler's Wells. The BBC Radio 2 Olivier Audience Award went to "Les Miserables", which has been seen by more than 60 million people in 42 countries. The Olivier Awards were sponsored by MasterCard.